Now, it’s high-time we levelled the books in The Pixel Empire’s staff contest, and what better way to achieve this than by putting the current leader firmly in his place? I must admit, I was smarting behind the bravado after being narrowly defeated by Shane at Rez. Losing at a game I admire greatly and have played extensively was tough to take, even for my hardened brain. I digress however; I now aim to prove that old dogs can still inflict a large bite. Our editor Tom is to be my victim, as both Alan and Shane have failed to thwart his gaming skills thus far, so I will now redress the balance and record some points for the veterans. I’m choosing a classic PlayStation title, one of which I am confident I have the experience and expertise to prevail over TC himself. He better bring his A-game, this will be a rough ride. Perhaps the most daunting Duel to date, nevertheless, it’s a challenge I simply couldn’t resist taking up as Chris proposed a battle on Wip3out. Completing every race, with every craft on Phantom class ranks alongside finishing the feat of finishing Resident Evil with an ‘S’ rank in terms of personal gaming achievements. Perhaps a sign of just how much skill the game demands, it’s one of the few that requires two or three days of play to recapture old skills, rather than just a few hours. Reactions must be honed and at their absolute sharpest, cornering must be finely-judged and utterly committed. Neither of us will be able to afford any mistakes as the laps are short, sharp and viciously unforgiving. 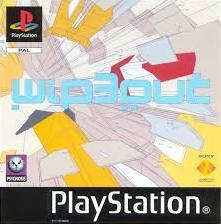 I’m hoping all those hours poured into it at the turn of the century, and indeed eventually reaching Zone 75 on WipEout HD (an experience that literally left my hands tingling) will have me playing at a good standard. 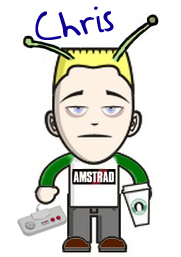 All goes well, and I’ll be partying like it’s 1999, and sending Chris back to the Hi-Octane school of futuristic racer drop-outs. And besides, after playing TOCA 2, everything seems easy, right? Stripping Wip3out down to the very basics, the challenge is a straightforward best lap time affair. 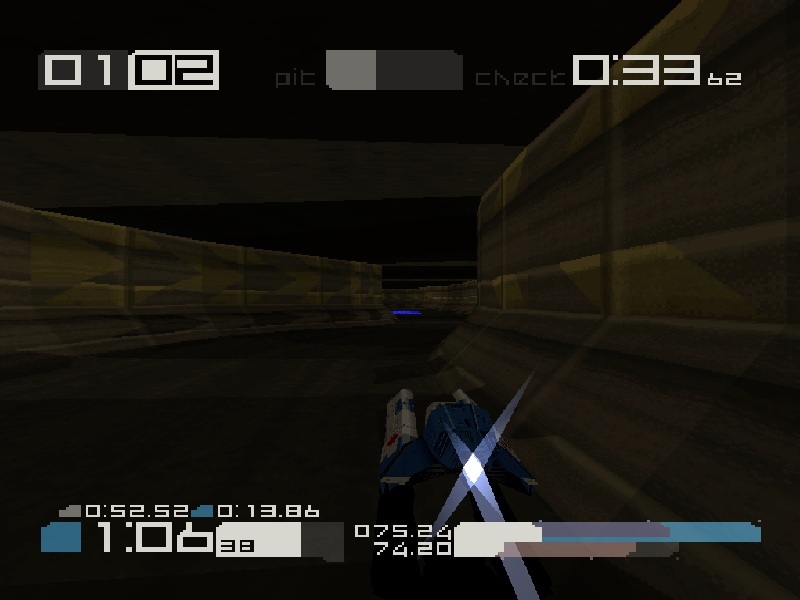 To eliminate any outside interference from the CPU and to level the playing field in terms of weaponry, the task is to be contended in Time Trial mode. 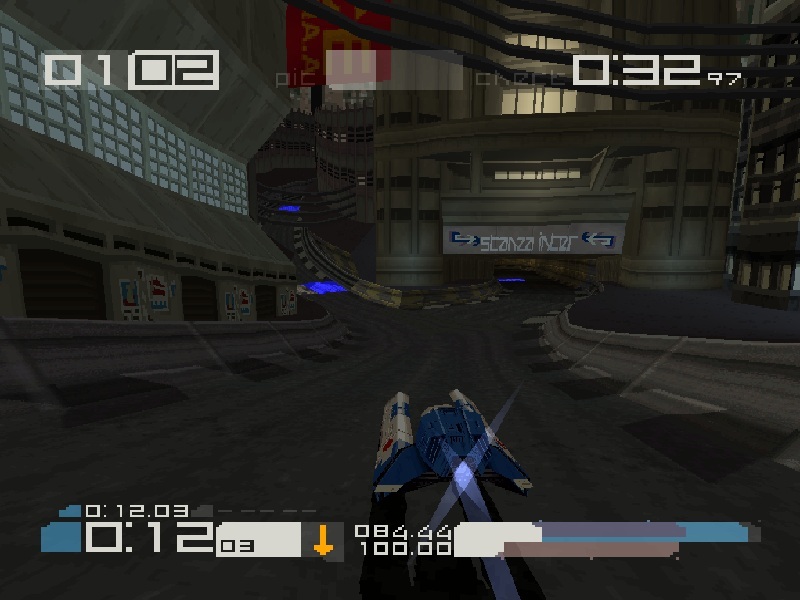 This removes other craft from the track and disables all power-ups, bringing the challenge down to a test of raw racing proficiency against the clock. The track has been agreed, the speed class set; the only variable is the choice of craft either of us can pilot, limited to the first four selectable vehicles only. If we had access to the other ships, we would both end up using the Assegai or Icarus. Like the last duel, the challenge will run concurrently between midday Friday 17th May to midnight Saturday 18th May. Scores will then be presented shortly after, and I will finally claim my win. Rules: Speed Class: Rapier. Course: Stanza Inter. 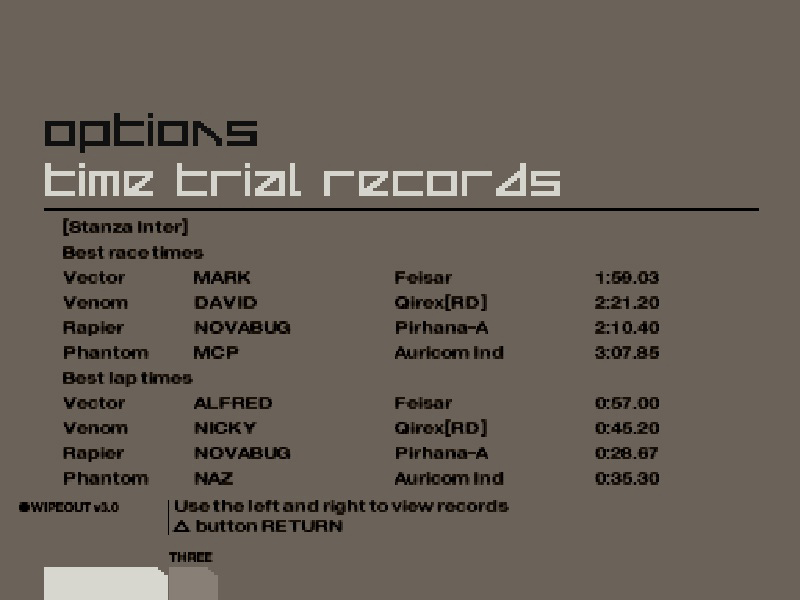 Mode: Time Trial. Craft permitted: FEISAR, Goteki 45, Auricom, Piranha-A. 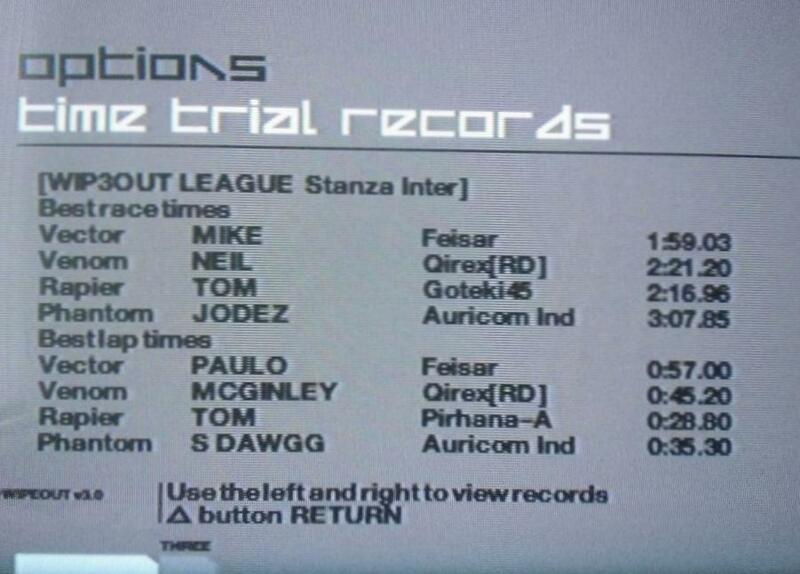 No cheats are allowed, the winner will be who posts the fastest single lap with screenshot as evidence. Final race time is irrelevant. 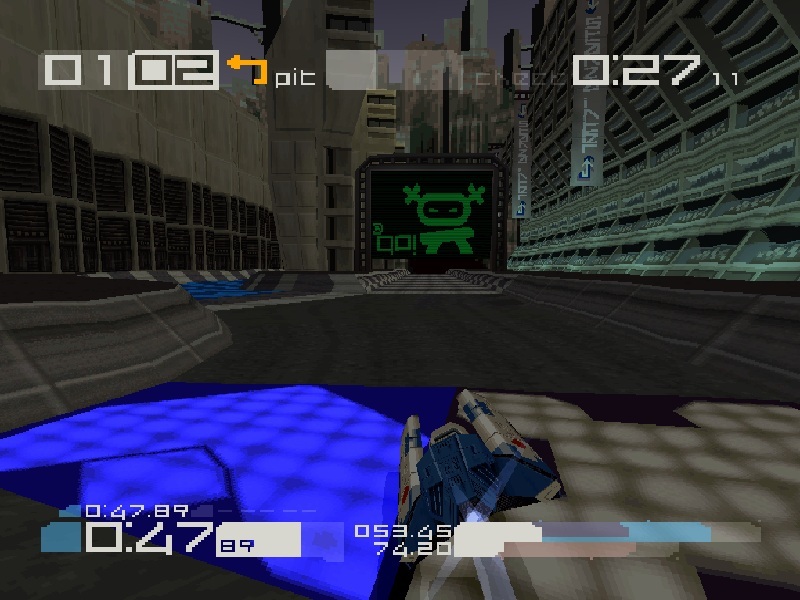 Stanza Inter; a true WipEout enthusiast’s course with many varied elements to test a player’s dexterity at AG racing. Upon fleeting casually over the track to grab a few key-point screenshots for this very article, it dawned on me that only two of the craft available would be fit for the job. The FEISAR and Goteki 45 are too sluggish, even though I have had past good experiences with the latter. (My very first perfect laps were achieved in this) The Auricom and Piranha-A are matched for top speed, with the balances tipped opposite ways for shield energy/handling. I started out with my old favourite, the Auricom. The thrust of this ship is superior to the Piranha, but negligible in use on Stanza Inter due to the track’s single long straight lane. After posting maximum times of 32.00 with it, I switched to the Pirhana with its superior maneuverability and immediately improved by scraping under the 32 second mark. The exchange of boost thrust to sharper handling made an astonishing impact of the times I could set. Now it was time to concentrate. Due to work commitments, Friday and Saturday evenings were to be my Wip3out sessions. Kids in bed, missus at work, I had peace and space to re-tune my rapidly ageing gaming reflexes. I knew from previous playing that it’s possible to achieve 24 second lap times in the Icarus (fastest craft in game) on Stanza, so weighing up the Piranha’s abilities, I estimated that a time of 27 seconds would be the very best I could hope for. I of course assumed Tom would be using the same craft, coming to similar conclusions as myself, so thus knew he would be going all-out. Friday’s evening session went by with a fair degree of frustration and gritted teeth. After remembering that taking the left lane at the fork is suicide for me, I practiced my chicane navigation for a few rounds before going all out at setting a decent time. After an hour I was still cursing my own arthritic laxity. Lap after lap, it seemed impossible to break the 30 second barrier. Also, I couldn’t seem to get all the required parts of the course correct in one lap, making basic errors after performing a quality move. If I weaved quickly through the chicane, hit the boost pad on the right and the next apex, my mind would congratulate itself prematurely and… a crash on the final turn would result. Over time I became more relaxed and finally breached the 30 second hurdle posting a nifty 29.56. Happy with my nights work, I switched off and spent the next 12 hours thinking about how to improve. I had big doubts this time would be enough to beat TPE’s Duel King. 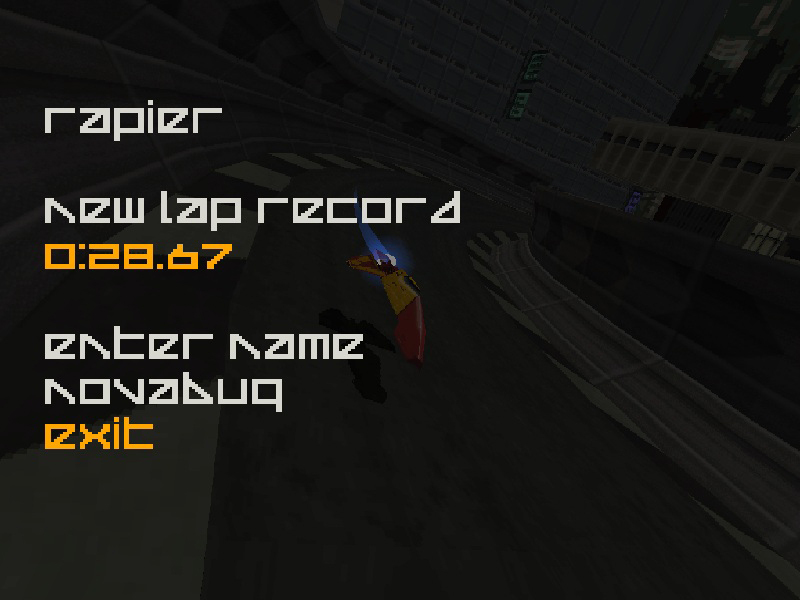 With the default Rapier record sitting at 35 seconds, I felt confident I could immediately start challenging. It takes time to get up and running though, and my best initial-run lap (albeit in the pedestrian FEISAR) was 39 seconds. Bugger. Still, choosing between the four ships was the easiest decision ever. The Piranha-A exhibited what the other three lacked: raw pace and mobility, with Stanza Inter absolutely demanding both. By my second run, the time was down to 34.96, a bit tidier and it was 31.64. On the first evening, I’d (foolishly) decided to try my hand at first-lap successes; hoping that the speed lost from standing-starts would be offset by the launch-start and perk of having full boost, something I felt would be difficult to retain if I had to motor round each time on a ‘warm-up’ lap. I continued to take the left-hand fork as I always had on Stanza Inter; the narrow straight path offered a preferable alternative to the tunnel, where a series of jinks negate the potential of boosting and present more opportunities for prangs. After brief panic/demoralisation as a couple of small improvements were eradicated due to the game crashing (no auto-save! ), I ended the night on 30.52. A perfect lap, Wip3out told me. But I couldn’t help but wonder, was it a fast one? On a game that exhibits such lightning speed, it was perhaps fitting that Chris and I should be separated by the merest coat of Piranha paintwork. Nevertheless, in a series where extracting every extra tenth can feel like a marathon in itself, Chris’s fantastic lap proved thoroughly worthy of victory. He found those extra thirteen hundredths of a second in a gloriously punishing challenge that demanded skill, commitment and eye-of-the-needle precision. I had the notion that nearly every one of Wip3out’s circuits would make for a worthy Duel, and who knows, maybe I can coax Chris into putting his futuristic-racing crown on the line again sometime in the future for another battle. 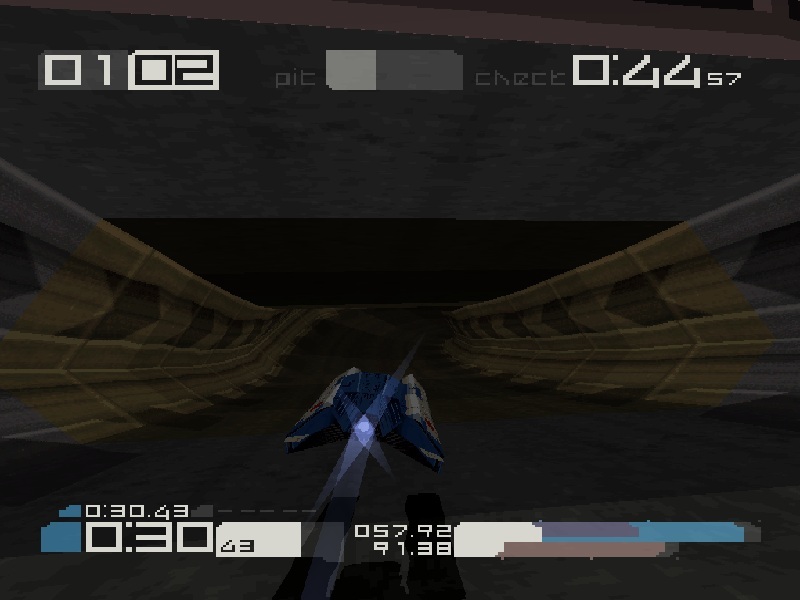 But that’s for another day; I’m happy with my efforts in Duel #4 and though the better racer won, I found Stanza Inter an entirely apt setting for an incredibly exciting Hi-Score Duel. When the results came in and I had overcome Tom by the narrowest of narrow margins, it wasn’t a feeling of elation, more one of relief. 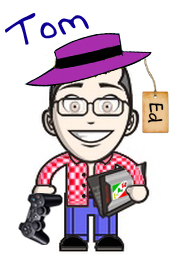 Rapidly approaching my 40s, I’ve still got some gaming acumen it seems. However, Tom’s time was outstanding and I would have lost if I had been complacent with my first final time. We both appear to be equally proficient at Wip3out and on another day Tom would have won, and deservedly so. Interesting that we choose different routes at the fork; I have always had trouble exiting the narrow path Tom took, so ignored it entirely. A great, exhilarating duel, as close as it could be, and as Tom says, Stanza Inter proved to be a perfect host. I’m more than willing to accept his offer of a rematch, maybe a Qirex-only face-off on the P-Mar Project! But for now, I have redeemed some pride for the oldies, so if you’ll excuse me… Get in!